The author of the award-winning, two-volume Matisse: A Life, now gives us the long-awaited, definitive biography of literary master Anthony Powell--the critic, editor, and novelist known as "the English Proust"-- that, at the same time, takes us deep into twentieth-century London literary life. 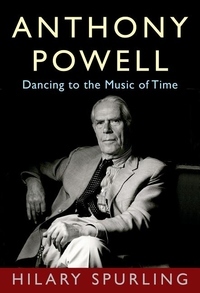 Anthony Powell (1905-2000), best known for his twelve-volume comic masterpiece, A Dance to the Music of Time, was also the author of sixteen earlier novels, plays, and biographies, five memoirs, and three volumes of journals. He was a prolific literary critic and book reviewer. Between the two world wars, before making his name, he kept company with rowdy, hard-up writers and painters--and painters' models--in the London where Augustus John and Wyndham Lewis loomed large. He counted Evelyn Waugh and Henry Green among his lifelong friends, and his circle included the Sitwells, Graham Greene, George Orwell, Philip Larkin, and Kingsley Amis, among many others. Now, drawing on his letters, diaries, and interviews, Hilary Spurling--herself a longtime friend of Powell's-- has written a fresh and masterful portrait of the man, his work, and his time. Insightful, poignant, and cinematic in scope, this biography is as much a brilliant tapestry of a seminal moment in London's literary life as it is a revelation of an iconic literary figure.